This history of the firm of Down & Needham in the village of Woburn Sands was originally published and sold in aid of Woburn Sands Youth Club in 1998. This version has been updated with new information that has come to light since. 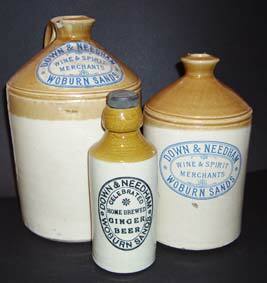 My interest in them began when I came across a Woburn Sands mineral water bottle at an antiques fair. In trying to find out how old it was, I discovered the links with farmers’ chemicals, veterinary medicines, pubs, and local buildings, I realised it made a fascinating story of one local family’s business interests. The Down family story can be traced back locally to Woburn in 1839. 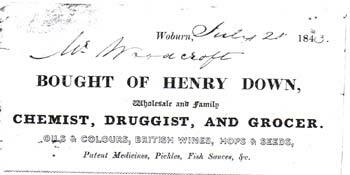 In December this year, a local chemist, Henry Down, married Emma Crofts, also of Woburn. He was 25 and she 21. Henry was the fourth child of Joseph Almond Down, who was a grocer and apothecary in Torpoint, Cornwall. Two of Henry’s brothers followed their father into that business and the youngest son became a renowned doctor. In Woburn, Henry produced an agricultural chemical called ‘The Farmer’s Friend’, which protected growing wheat crops from disease and pests. He died just ten years later, from “the fearful epidemic which prevailed in the kingdom” (which was Asiatic Cholera), but he had fathered four children, Elizabeth Hannah (1843), Henry Edward (1845), Emma Ann (1847), and Frederick William (1848). 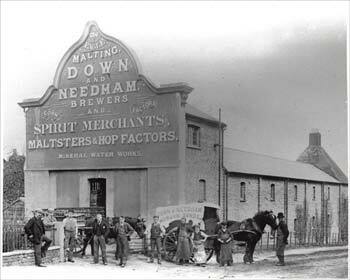 It was the Down brothers who went on to create a large business empire in this area. The widowed Emma Down is recorded in a local trade directory of 1861. “Down & Co.” as a company was already in existence, but as Henry Jnr. was only 16 at the time, it must have been Emma and her father, William Crofts, who were running it until such time as came of age to control it. In 1864 they were still trading from Woburn, but by 1866, the family had moved to Woburn Sands. Emma Down was living at Haydon House at 29 Station Road. Haydon is a middle name that crops up in the Down family, so possibly they had named their house themselves. No detail is given for the brothers, but the Company was listed as being at Woburn and Woburn Sands. Their factory premises were approximately opposite Fulbrook School in Weathercock Lane, which has since been converted to houses. Haydon House, a large mansion building, was let to Emma Down by her father, William. He made provision for it to pass equally to the four Down children upon Emma’s death. The two Down daughters were soon married; Elizabeth Hannah to Henry Freeman this year and Emma Ann married William Edward Clark the next. The 1871 Census listed Emma Down as proprietor of the Company, and Henry and Frederick as the manufacturers for it. Also living at Haydon House was Mary Haydon Price, a niece aged 24 from Camden Town. In addition, there were two servants at the house, Jane Small (23), a cook originally from Long Crendon, and Anne Hawtill (19), a housemaid from Kingsthorpe, Northants. This was also the year of publication of the Mercer and Crocker’s Trade Directory. 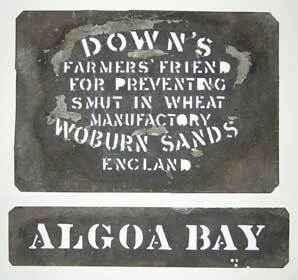 This carried a small advert for Down & Co.’s Farmers’ Friend and the Company soon began expanding. They bought a large plot on the corner of Station Road and Russell Street (which had only been laid out the year before) and built their ‘Eagle Malting’ here in 1875. The land was acquired from William Clarke (another local corn merchant) who had not developed the site. I am unsure as to whether the malting referred to was part of the chemical manufacturing process or as a service for local farmers. 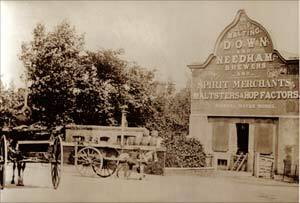 No advertisements ever specify beer brewing and Company was only referred to as Maltsters and Corn Merchants. The original Downs’ shop front has been built-out from and is still connected to the drink trade today, being an off-licence. The malting premises behind it has been shortened and developed into terraced town houses. 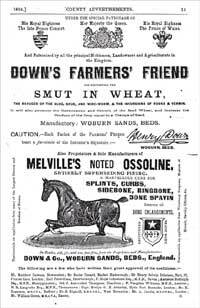 In 1874, the Downs began to exhibit their Farmers Friend product at the Royal Agricultural Shows. This year it was local, at Bedford, although in subsequent years it was further afield. Out of the next sixteen years they only missed four shows, but still attended as far away as Bristol (1878), Carlisle (1880), and York (1883), so they could promote their product throughout the country. In 1876 they bought much of the Swan Field estate. This comprised the Swan Inn, surrounding land, and also much of the land on the opposite side of the High Street, from Aspley Hill down to where the petrol station now stands. Henry also got married this year, to Grace Hayward of Willesden. In the 1876 Harrods Directory they had a large advertisement occupying half a page, headed by three Royal Warrants; for Queen Victoria, the late Prince Consort, and the Prince of Wales. The Royal Warrants Office hold only patchy records for before 1900 and no records relating to the Downs can be found. 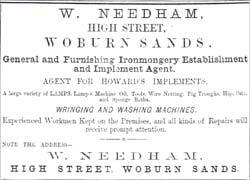 The advertisement specifies that the manufacturing was done in Woburn, which was probably used as a better-known market town name than that of Woburn Sands, and they still had large connections there. Packets of Farmers Friend could be bought for 9d but there is no indication of size or weight. In 1877, Henry had moved out of the family home at Haydon House and was living at Woodfield, a large house in Weathercock Lane (which was then called Aspley Lane) and had had his first child, Florence, followed by a son, Henry Jr. the next year. Henrys brother Frederick was still living with his mother – although soon after he also bought his own house, Avenue Lodge, at the corner of Station Road and Theydon Avenue, almost across Station Road from Haydon House. The Downs purchased the remaining portion of the Swan Inn buildings in 1878, which consisted of the old school rooms and a couple of attached cottages on the Hardwick Road corner. They were now one of the largest employers in Woburn Sands, and treated all their employees to “a substantial supper and dancing” to celebrate Christmas in 1878. Down & Co were regularly advertising in local papers by 1879, usually during the autumn and winter months. The adverts rarely altered in size or detail for the next twenty years. The No. 8 Company of the Woburn Rifles were using the Downs’ field opposite the Swan for drilling practice under Captain Webster in June 1880, although later they moved to the new hall built at The Fir Tree Hotel. Henry had also moved into horse dealing by this time, and ran an advert in the personal adverts of The Times from 1879 to 1887, and seemed to specialise in horses for hunting. According to the 1881 Census, Frederick is listed as still living with his mother at Haydon House and was now renting out his own Avenue House. Emma Down was 59, and had a young lady, Emily Stannard, (25, from Cannonbury, Middlesex) living with her as a companion. There were now two different servants – Elizabeth Mason (28), a cook from Warwickshire, and Isabelle Gostie (26), a housemaid from Northants. Frederick was still unmarried. Henry is listed with his wife and two children and a cook/servant Elizabeth Crute, 21 born in Aspley Guise. The next year, he bought Odell’s Close and the land it led to, which he had already been renting. The land is where the Social Club was, and Club Lane leading up to the High Street. 1883 saw a Down brother in conflict with the law; Frederick was summonsed for sending two pigs to market in Newport Pagnell in disregard of Privy Council orders. This was perhaps a local order restricting animal movement due to an outbreak of foot and mouth disease or similar – diseases which were common at the time. He claimed not to have known about the order but was found guilty and fined 10 shillings with 9s 6d costs. More in keeping with their beneficial image, August saw the Downs lending land to the Newport Pagnell Wesleyan Circuit for a concert and picnic. In 1884, they lent Swan Field to stage the Aspley Guise and Woburn Sands Garden Society annual show. By 1885, there had been a major addition to their successful Wheat Carboliser business when they moved into veterinary preparations. 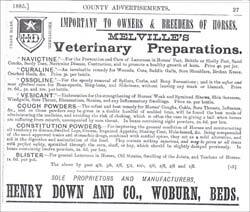 A large advert in the Kelly’s Directory of this year gives seven remedies produced under the trade name ‘Melvilles’ with Henry Down & Co. as the sole proprietors and manufacturers. These were; Ossaline, Navictine, Curaline, Vesicant, Suppurine, Cough Powders, and Constitution Powders. These formulations (allegedly) cured everything in horses from lameness to bone spavin, sore throats to rheumatism! A trademark for Henry Down & Co. was displayed on the packaging and the label states that the product was made in Woburn. These preparations were now shown alongside Farmer’s Friend at the Royal Agricultural shows they took stands at. 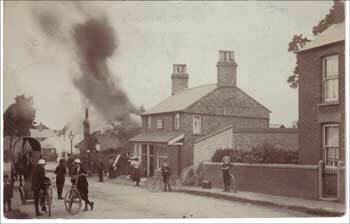 In 1885, the Down brothers bought eight cottages in Aspley Hill, those surrounding Harefield Cottage. These all came with incumbent tenants. Some of these cottages are now numbers 21 to 27, although two later collapsed during building work and had to be rebuilt in replica. In January 1888, Henry organised collections for the unemployed whilst Frederick was entertaining at concert evenings with his selection of comic songs. Frederick had become involved with the council, and chaired a council committee regarding the street lighting. In October 1888, complaints were made regarding the award of a contract to clean and maintain the street lamps. No tenders were invited and Frederick Down had given the job straight to Mr William Needham – who happened to be on the same committee This was possibly the first deal they made together, but it would certainly not be the last. Since 1885, Frederick had been an agent for Phipps, the brewers who started life in Towcester but had moved to Northampton. This fact is recorded in a report when Frederick fell off his horse on the Woburn Road in 1889. By this time it appears that the Downs had already moved into the Public House trade elsewhere, as well as owning The Swan in Woburn Sands. There is a report dated November 1889 that an employee of theirs, James Mabley, had been recalled from an inn in they ran Ledlington, Cambridgeshire, to work back at the malting in Woburn Sands. It made the paper because his son, George, had arrived back gravely ill and soon after died of scarlet fever. There is no Ledlington in Cambridgeshire and the report would appear to refer to Litlington, near Ashwell, as Down later sold a beerhouse there, called “The Beehive”. As well as the council, Frederick had become increasingly involved in helping at St Michaels Church in Woburn Sands, and in 1889 his eligibility for the post of Church Warden was questioned by a Mr Clarke. After a vote, (which Frederick won by 17 votes to 8) Mr Clarke complained to the Bishop that Down was not a fit and proper person to hold this office but the appeal was overruled and Frederick claimed the post. It is thought that Frederick’s entrepreneurial flair had angered some of the more conservative members of the church and perhaps the fact that he dealt in liquor was also held against him. Frederick resigned the post in 1895 after Mr Woodhams – who had also previously objected to him – was voted in as Co-Warden. The brothers’ mother, Emma Down, died in 1890 at the age of 69. Her funeral was a lavish affair with a handsome funeral carriage covered in floral wreaths and crosses. The casket was of elm and oak and most of the village closed for the duration. She was buried in St Michaels Church in Woburn Sands by Rev. Moss and Canon Bartlett. She was the last surviving daughter of William Crofts. Her husband had been buried at Woburn, but she was laid in a large vault capable of holding six people in St Michaels Churchyard. Frederick stayed on at Haydon House. In the same edition of the ‘North Bucks Post’, as the funeral report, there is the description of a supper organised by Frederick. He invited all the people in the village who were over 60 to attend and enjoy an evening of entertainment. As well as tables ‘groaning with food’, Phipps’ ales were served and tobacco and snuff was laid out on the tables for the 150 guests. It took place at the Institute Hall on February 6th. The paper quoted “The Down family are perhaps the richest in Woburn Sands and not slow to be liberal”. Frederick’s employees had helped with the preparations and Mr and Mrs Needham had lent a hand as well as many other ladies from the village. The Downs had also lent land to Woburn Sands Football Club this year. Their advertisements ran in the North Bucks Post and the new Kelly’s Directory. One half-page advert was for their Ossaline product, which received glowing testimonials from masters of foxhounds and horse trainers who recommended the compound. In March, the Woburn Sands, Wavendon, Aspley Guise and Woburn Constitutional Club opened in the Old School Rooms at the Swan. The Downs had donated the premises and paid to fit it out. Frederick became honorary treasurer and W. Bazley, who worked as their clerk, became the secretary. This year again, they lent land for the local flower show. The year of 1891 did not get off to a good start for the Downs, as Henrys’ wife Grace fell off her horse when it was frightened by a pheasant on the Bow Brickhill Road. She was confined to bed for a week. Frederick was having a better time, singing at Constitutional concerts. His usual rendition was ‘Where did you get that hat?’ During January, the Downs had organised the giving away of sixty gallons of soup to the needy of the local villages. More tragic events overtook them, when Henry Down passed away on March 6th, leaving behind his wife, Grace, and five children. His death is recorded in a large report in the Bedfordshire Times. It states that the sad event took place at his residence, Woodfield, after a short illness, probably due to complications from a chill he had caught in London a week before, developing into pneumonia. He passed away just as his uncle, Dr Langdon Down, arrived from London, having been telegraphed to assist. Langdon Down was a specialist in child disability and was one of the first to promote the idea that handicapped children should be taught alongside other children. He had founded a Hospital at Hampton Wick in London in 1868 called Normansfield. He also became a Fellow of the Royal College of Physicians and consultant physician to several London hospitals. In the 1960’s, when the World Health Organisation wanted to replace the term ‘Mongol’, which Dr Langdon Down had designated, for a term more suitable, they chose Down’s Syndrome to honour the doctor and his work. Henry had been a director of the Woburn Sands Building Society, a member of the Gas Lighting Committee, and a member of the Cottage Garden Society Committee. He was only 46 years old. Henry’s widow Grace and two of his children, Miss Flossie and Master Henry, (the others being Dorothy, Charlotte, and Robert) attended the funeral as well as Frederick, their friends, employees, and servants. The coffin was described as polished oak with massive brass fittings and a brass plate recording his details. Hymns included were ‘On resurrection morning’, and ‘Now the labourer’s task is over’. All the principal shops in Woburn Sands were closed during the funeral and blinds were pulled down in the private houses along the route. A smoking concert due to take place at the Constitutional Club was cancelled as a mark of respect. Henry’s body was taken up the High Street to St. Michaels for burial where he was laid to rest beside his mother. The Downs had been conducting business in the area for at least 50 years by then, and also taken a great interest in building and bettering the town. He was obviously greatly missed. The firm of Cumberland and Hopkins were employed to sell up his effects. Henry died intestate and Grace administered the will with the aid of the solicitor Henry Petite of Leighton Buzzard for the legal work. He left an estate of £5,438 13s 4d (worth now over £200,000) and was described simply as a ‘merchant’ in probate records. Frederick later bought up most of his late brother’s share of the business and so became the senior and sole owner of Down & Co. The Needham family had become close friends of the Downs, perhaps because of the close proximity of their respective businesses, with Williams’s ironmongery business just across the entrance to Russell Street from the Eagle Malting. They had sent a wreath to Henry’s funeral, as they had done to his mother’s funeral the previous year. The first reference I can find to William Needham locally is in 1887. He ran a front-page advertisement for his ironmongery business in the ‘Liberal News and North Bucks Flying Post’. He and his family had moved to the area from Brentford and he was soon to become an important part of this story. He rapidly built up his business and in 1890 was advertising in the St Michaels Parish Magazine. There are some Codd bottles (those with marbles in the top to keep the contents fizzy) bearing the name “Woburn Sands Aerated Water Company”, which also have a large “N” embossed underneath them. I believe these were being produced by William Needham. It would appear that it did not take Frederick long to get over his brother’s death, as by September he was expanding his public house trade significantly. He bought the ‘Wolsley Arm’s’ in Bedford, and in October, the ‘George & Dragon’ in King Street, Potton. Perhaps Henry had been agaist the idea of expanding the pub trade, but now Frederick had a free hand. Frederick must have looked around for someone to become the new junior partner so that he could delegate some of the responsibility for the rapidly expanding business. William Needham had been helping him at St Michaels as Aidsman when Frederick was Churchwarden. It is useful that a Census took place in 1891. It recorded that Needham was 31 and his wife Amelia was 29. Their one child, Elsie Mollie, was 6. They also employed Kate Finnessy (22) as a servant in the house, so William’s trade must have been reasonably good. Frederick, who had now moved back to Haydon House, is described as single and a maltster and corn dealer by trade. He had two servants, Julie Ellen Ketford (27) from Bedford, and Emily Maud Rogers (20) from Northants. According to the Bedfordshire Mercury, all the employees of Down & Co and Down & Needham enjoyed a treat of a day trip to Great Yarmouth in August. About 40 went, which could have included wives etc. Despite the expansion of his pub estate, Frederick’s connection with the brewers Phipps of Northampton ended in acrimony in 1892, when he sued them at the New Law Courts, London to recover commission and expenses owed to him and for wrongful dismissal. Phipps admitted that they owed him over £570 but denied the other charges. However, during the second day of cross examination, the two counsels had a private meeting with the Judge, Lord Chief Justice Coleridge and it was settled that Phipps would pay a total of £2001 15s 2d (about £82,000 now) and also costs. Later local advertisements for Phipps made it abundantly plain that they had no connection with Frederick Down any more! Frederick had also become president of Woburn Sands Albion F.C. and also hosted the flower show again. In 1893 Frederick was voted in as Churchwarden of St Michaels again using the slogan of “Peoples Friend” in his campaign. Expanding their trade, they bought the “Queen Victoria” a licensed beerhouse in Wrestlingworth in October 1893, for £470, with another £135 for the field beside it. I find it odd that their move into pubs was so far away from the business base in Woburn Sands. Why did they not start buying pubs more locally? … so they just managed to get their money back on the Queen Victoria! The Northampton Mercury of Friday 30th August, 1895 confirms they were also interested in soft drinks, as well as hard. Down continued dealing in buildings and land with Needham. They purchased no.47 Station Road from George Spreckley in 1895 and next year, sold 118 Station Road to Thomas Yirral, a well-known local builder, and transferred the ownership of the Malting from Frederick and Henry’s widow Grace to Frederick and William. Woburn Sands – Important Property Sale – The most successful sale held in Woburn Sands for the past twenty years took place on Wednesday at the Swan Hotel. The sale was pursuant to an Order of the High Court of Justice, dated April 5th, and made in an action, Down [Grace] v. Down [Frederick]. The auctioneer, appointed by Mr Justice Chitty, was Mr Edward Anthony Cumberland, of the firm Messrs Cumberland and Hopkins. Business commenced soon after 4 o’clock, and the company was large and representative, the property being in twelve lots. Lot 2 and 3 comprised freehold building land of 4 acres and 32 poles, situated in Station Road and Aspley Guise road. Bought by Mr F W Down, Woburn Sands for £1,400. Lot 4, detached villa, situate in Aspley Guise road known as Harefield Cottage, bought by Mr F W Down, for £320. Lot 5, four cottages situate in Aspley Guise road, bought by Mr F W Down, for £280. Lot 6, four cottages situate in Aspley Guise road bought by Mr F W Down for £290. 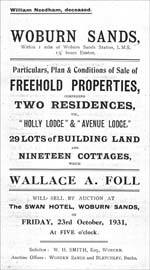 Lot 7, a plot of building land, containing about 516 square yards, situate in the Aspley Guise road, bought by Mr H B Mallam, solicitor, Woburn Sands, for £150. Lot 8, a corner plot of building or garden land situate on Aspley Heath, containing about 100 poles, bought by Mr F W Down for £225. Lot 9, the 12 quarter malting and office, situate in Station Road and Russell Street, bought by Messrs Down and Needham for £760. Lot 10, a plot of building land containing one acre 2 roods and 28 poles situate in Station Road, bought by Mr F W Down for £560. Lot 11, a plot of building land, having a frontage of 90 feet to Station Road, bought by Mr G Garside Jun., Leighton Buzzard for £180. Lot 12, a cottage with garden in Weathercock Lane bought by Mr F W Down for £95. The total realised was £7885 and the good prices indicate that Woburn Sands is well on the way to prosperity and is obtaining increasing recognition as a health rest, the dry sandy soil and extensive pine woods being very beneficial to invalids. …and thus the ownership of The Swan Hotel passed out of local hands and into big business and the breweries, but Frederick was able to keep hold of much of his property, including the Eagle Malting. In 1897, Frederick bought no.49 Station Road, the last building before the corner of Weathercock Lane. He also bought up some of the shop fronts around the corner of Russell Street and built no. 3 and possibly no. 1 as well. This is the first reference I have seen to their having opened a Bedford depot for their business, in addition to their Woburn Sands base. Perhaps it was set up with the revenue from their various property sales. Now they changed their embossed bottles from ‘Woburn Sands Mineral Water Works’, to include ‘Bedford and…’ at the beginning. 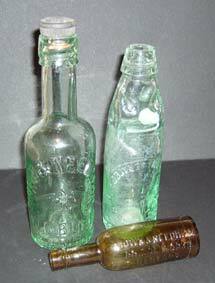 They also had bottles marked ‘Bedford Bridge Works’. These premises were in a Hall that had been opened behind the Bridge Hotel in 1892, in the St Marys area of Bedford, by the river. It was originally used for auctions and dinners, but the Hotel must have found it more profitable to rent it permanently to a business. When the Hotel changed hands in August 1895, it came with an “Aerated Mineral Water Works” already using the hall, but there is no information as to who was then running it. Had Down & Needham already moved in, or did they buy this business from someone else? “WOBURN SANDS Important Employers Liability Claim. By 1898 Frederick had become involved with the Board of Woburn workhouse before it closed down at the end of the century. The size and prominence of the various advertisements on the shop front give an indication of what was important to the firm at this time. The demand for beers and spirits from the surrounding villages must have been huge. The local historian Arthur Parker had a chance to talk to one of the ‘boys’ in the picture who by then was about 90! Tom Barker remembered going out on deliveries over a wide area to sell the ‘phizz’. William Needham is leant on the railings, and William Bazley, their clerk, is stood next to him. Two of the other boys are Abraham Dolton and one of the Tomkins family. The picture of their factory and shop front is from before 1898, as the Malting was sold to the Watford brewers, Benskins. Also sold to Benskins at the same time was the ‘George & Dragon’ in Potton, the ‘Wolsley Arms’ in Bedford, the ‘Clifton Arms’ in Dunstable (purchase date unknown), a quantity of land in Kempston, around the corner of Spring Road and College Street, and the leasehold of ’The Plough’ in Simpson – the closest of their far flung properties. The ‘George and Dragon’, Potton is still open, it passed from Benskins through amalgamation to Ind Coope to Greene King. The ‘Wolsley Arms’ is now shut. It stood on the corner of Wellington Street and Albert Street, and was run by Robert Thompson. Frederick had owned it since 1891. The ‘Clifton Arms’, Dunstable stood near the Square on High Street South – no. 157. (The house numbers were changed in the 1920’s). It was being run by George Leech. The Kempston land had been bought in 1897 and consisted of two pieces of land on New Spring Road, in front of Brigadier Depot Barracks. ‘The Plough’ at Simpson, Milton Keynes is now in the hands of Charles Wells, Bedford. When Down and Needham sold its lease, it was being run by Oliver Davies. 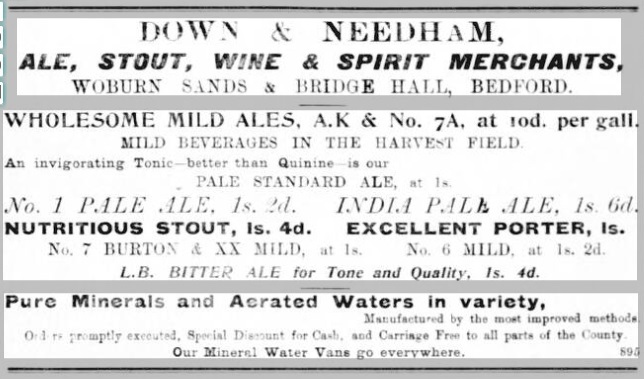 In the sale agreement, signed by both Down and Needham, was an undertaking that neither of them would operate or be involved in brewing, beer vending or maltstering in Bucks., Beds., Northants., Hunts., Cambs., or Herts.! For the estate and the agreement they got £9900. There was provision in the contract for written permission to be granted to them if they wished to carry on in the trade, which may explain how they came to buy two pubs, ‘Hole in the Wall’ and the ‘Golden Eagle’ in Biggleswade the following year. The former was a small beer house at 76 Shortmead Street, entered by a narrow alleyway between two houses. It closed in 1912. The latter was beside the bridge at 87 High Street. It was run by James Cobb during this time. It was eventually closed by Charles Wells in 1920. These two properties were not in their possession for long, however, as the ‘Hole in the Wall’ was sold to Jarvis of Bedford for £340, and the ‘Golden Eagle’ to Charles Wells of Bedford for £500, both on June 22nd 1900. With so many purchases and sales, it’s hard to keep up with exactly what they now still had. 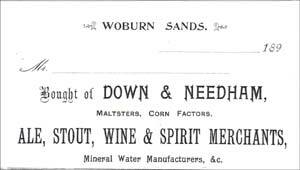 A witness, who called to an the inquest about a murder in Woburn Sands in 1899, was a drayman for Down and Needham, who were now described as “mineral water manufacturers at Bedford”, so the Bridge works were still theirs then, although adverts began appearing in the Bedford press from June 1900 trying to sell “a mineral water works in central Bedford”, and I believe this was Down & Needham trying to sell the Bridge Hall works. The new year of the new century saw the purchase of 11 Station Road, ‘Sandymount’, along with land running right back to Weathercock Lane. 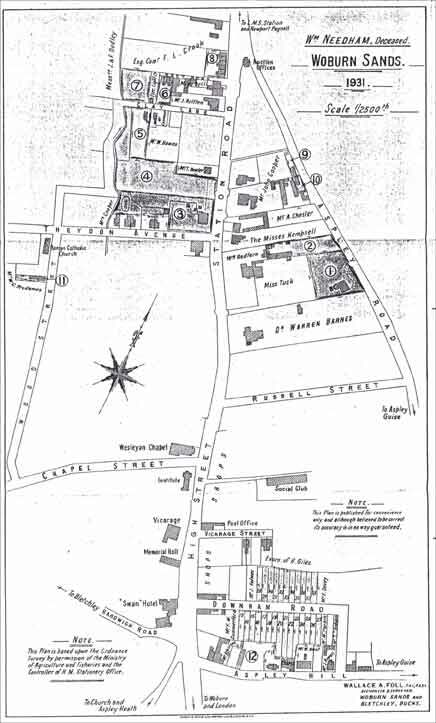 Frederick divided the land in half and built a property called Northolt on the Weathercock Lane end. He also bought a warehouse in Sheep Lane, Potsgrove from the Trustees of the Protestant Dissenting Chapel. Frederick Down was back in court in 1900. In March he was sued for £6 15s by Alfred John White, a carrier from Cranfield. Mr White was claiming the money for a horse he had bought from Frederick, which Frederick had supposedly guaranteed as a gentle and hard working horse. He bought the horse for £20 but before he came to collect it he heard it was a ‘kicker’, and would not suit his cart. Mr White asked Frederick’s clerk, Bazley to write on the receipt ‘Warranted quiet in single and double harness’. Bazley refused, saying that Mr Down had said no such thing. Mr White took the horse, after complaining to Frederick, and later sold it by auction in Bedford, saying it had kicked violently when in harness. He was suing for the difference to what he had paid for it. Mr A Gilchrist-Langley prosecuted for Mr White, and Mr Henry Petitt, of Leighton Buzzard then replied. He said no warranty had been given and Mr White had had every opportunity to try the horse first. Mr Bazley and Frederick’s groom, Josiah Barker, were called and both swore no warranty had been verbally given. Finally, the farmer from Eversholt, Mr Humphries, who had bought the horse from Mr White, stated that he had not seen or heard of it kicking once. Mr Down was exonerated and awarded costs. The trial was at Newport Pagnell before Sir Alfred Marten QC. Going back to his good deeds, Frederick rented his half-timbered building in Russell Street to the Woburn Sands Men’s Club as their new club house for the sum of £25 per annum. In 1901, Frederick became chairman of Aspley Heath School Board, although there were some objections to the accuracy of the ballot results – apparently some seventy people had been left off the register. Frederick gained popularity with the pupils by giving them a penny each to encourage good attendance! 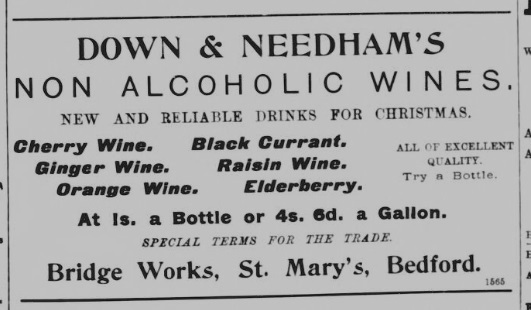 Down & Needham were still running a beerhouse in Kempston, it had a caretaker listed as Harry Briden, not a licensee, so perhaps it was only an off-licence. It was located approximately where they had previously sold land to Benskins, in Spring Road. In 1902, Frederick Down started just to build six Almshouses in Station Road for his elderly employees and local townsfolk. However, he was never to see them completed, as he died on June 6th, aged 53, at Avenue Lodge, which had been transferred to Needham. He had not been well for several weeks, and friends had feared that he would not live long. He was remembered as being most helpful to everyone, and beneficial to all. In the local press, his death is described as closing an interesting and successful career and that he would be sadly missed. No mention is made of his business activities regarding drinks – hard or soft, but Farmer’s Friend and Melville’s Ossaline are remembered. He had held many public offices including; District Councillor, Parish Councillor, Life Governor of Bedford County Hospital, Life Member of the Royal Agricultural Society, Honorary Member of Aspley Guise Working Mens Beneficial Club, Honorary Member of the Aspley Guise and Wavendon Oddfellows Club, and Honorary Member Forresters Club and many other institutions. He had never married and was buried at Woburn Old Church with his father where Rev Dickinson officiated. The choir from Aspley Heath School attended. He left an estate of £26,906 4s 3d (worth now just under £1,000,000) which all went to William Needham as Frederick had no immediate family, which was to prove a very contentious point. Perhaps Frederick was still cross that his brothers widow had taken court action to force him to auction off most of the company assets, which he then had to buy back. Whatever the reason, Needham was left with the entire company to do with as he wished, and it seems his wish was to retire on the spot! As the Eagle Malting had already passed out of their control before Frederick died, I wonder if the mineral water works had then transferred to the little factory off Weathercock Lane, now known as the Coach House? “The most noteworthy charity is the six almshouses … well-built with a sitting room, bedroom and scullery all on the ground floor … with a good garden. The tenant gets rent-free accommodation with a 5/- allowance for maintenance. These have been finished by Mr and Mrs Needham in a thorough and noteworthy manner.” The Almshouses still stand today as nos. 68 – 80 Station Road. In 1903 William is listed in the Trade Directory as just a private resident, but it appears that he kept the name of Down & Needham going for his business ventures. William was now 43 and after inheriting such a large amount, seems to have slowed down the dealings, although Farmer’s Friend was still being produced under the Down name. William Bazley had been chief clerk for Down & Needham and he and Henry Petitt, who had both appeared in court as witness and solicitor respectively in the case regarding the allegedly kicking horse, now appeared in court again. This time, however, they were on different sides. After Frederick’s death, it was discovered he had left everything he owned to Mr and Mrs Needham. Henry Down’s widow Grace and her children contested the will, all the way to Court. William Bazley and Henry Petitt had been witnesses for the will, and Bazley had also received nothing in it, although in previous drafts, he had been provided for, and even left some land. He had first worked for the Downs’ mother at the age of fifteen, transferring employment to Henry Down, and then Frederick upon Henry’s death, and was now manager of the Wheat Dressing Works while the will was sorted out. Mr Petitt was in Woburn Sands on business and mentioned to Mr Miller, the local printer and County Councillor, that Frederick had cut Bazley out of his will because he no longer trusted him due to mistakes Frederick had found in Bazley’s bookwork and he had lost confidence in him. This gossip got back to Bazley and after a written demand for an apology was refused, he sued for slander. The case was held before Mr Justice Ridley at Bedford on June 20, 1903. Several of Down and Needhams’ servants were called as witnesses who confirmed that Frederick had been unhappy with Bazley’s book keeping and records, although nothing had been said to Mr Bazley directly. After legal arguments as to what had been said and whether it was Frederick’s view or Petitt’s view, the jury retired and soon came back in and found for the plaintiff, William Bazley. He was awarded £150 damages. During the case, a letter from Frederick Down to William Needham was read out, which had been written just before his death. It asked for the Needhams to set up provision for each of his late brother Henry’s children, who were to receive £20 per annum until death, Bazley to get 10s per week till death ‘providing he behaves well’, Barker the groom 10s per week; Randall, the carpenter 7s 6d per week, and Tompkins, the warehouseman, 5s per week. There were also instructions for an endowment to the Royal Agricultural Benevolent Institution, Charles Street, St James, London for £26. It would be held in the name of ‘Fred W Down of Woburn Sands Memorial Fund’ for two applicants each year. He goes on to express the hope that his recently started Almshouses are finished and endowed with 5s per week and 3lbs of prime beef, ¼lb of tea, and 1lb of plums in the week before Christmas. Frederick’s will was finally sorted out in July of 1903 when the solicitors representing all of the parties met before the Rt. Hon Sir F. H. Jenne. Agreement had been reached where all of the requests in Frederick’s letter to Mr and Mrs Needham would be fulfilled, plus an award of £250 to Dennis Clarke, one of Frederick’s nephews. The remaining Down family then withdrew their accusations that the will had been made under undue influence of the Needhams and arrangements were made for the inheritors who were not yet of legal age. In 1904 Bazley purchased the business of Clarke’s Wheat Carbolizer from Clarke’s widow in Woburn and set up in competition to his previous employers. Perhaps he had fallen out with Needham now that Frederick’s opinion of him was well known. He had a good trade, exporting to South Africa and Australia. From 1907 Bazley was one of the first members of the newly commissioned Woburn Sands Parish Council and stayed with it until 1922. 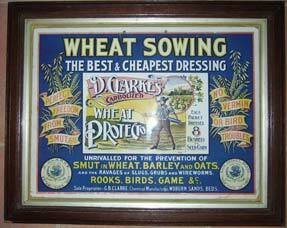 Bazley continued his Clarke’s Wheat Carbolizer until at least 1939 when it was being sold from 15 Bow Brickhill Road. I have yet to discover if this Clarke was a relation of one of Henry and Frederick’s sisters, who married into this family. The Down name was certainly kept going when William had number 73 High Street fitted out as a fish shop in 1904 (as it remains today), and the Down name was also used when William had plans drawn up by Grovers of Dunstable for a road running over his land at the top end of the High Street. The road ran from the High Street, parallel to Aspley Hill for some distance and then turned sharply at the top to join it. 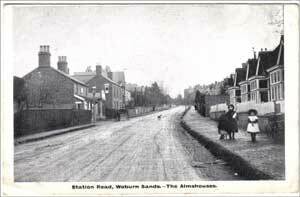 William called the new road Downham Road after Down & Needham, but it was not built on until 1938. In 1906, Needham, with his inheritance of Frederick’s buildings in Russell Street, had inherited the incumbent Social Club, who now informed him that the rent of £25 p.a. was too high and they would have to vacate. He lowered it to £20 and returned a further £4 as a donation. The Club had rented the property from Frederick since 1900 and the connection continues past 1920 when the Social Club bought the property it sits on today and erected the buildings that were there until recently demolished. Sometime between 1897 and 1902, Frederick had erected a little thatched cottage on the corner of Weathercock Lane and Station Road, which was used as a clubhouse and rest stop for the local cyclists. One morning in the summer of 1906, a Foden steam wagon paused outside it to stoke up its engine and a spark burnt the building to the ground. Robert Cheetham, the local photographer was enterprising enough to fetch his camera as the fire took hold and some interesting postcards were made depicting scenes during and after the fire. Over the years, William proceeded to sell off much of his property. 47 Station Road went in 1907, and the property in Aspley Hill (numbers 21 -27) in 1908. He also transferred property that was solely owned by his wife Amelia into their joint name. Avenue Lodge was being rented out to Mrs Mary Green, widow, of Bedford at a rent of £70 p.a. A Mr T. Redfern witnessed that contract. He was later to marry William’s daughter Elsie. By now, William had moved with the times and had his own telephone number: ‘15’ at Haydon House, and Tommy Redfern was no. ‘21’ at Sandymount. 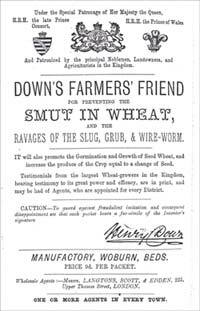 Down’s Farmer’s Friend was still being sold in 1910, as advertisements for it appeared in the ‘Woburn and District Reporter’. These advertisements are somewhat confusing as they state that the firm was established in 1888, and that the proprietor and manufacturer was Frederick Down, who by now had been dead for some eight years! In 1913, William helped finance the Aspley Guise and Woburn Sands Golf Club, and became one of the founding members of the original 9-hole golf course. By the next year he had moved into the Downs’ old family home at Haydon House. 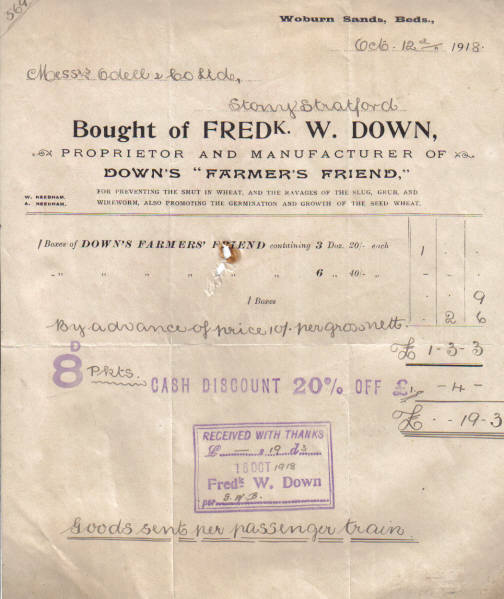 A directory of 1914 has Frederick Down as proprietor of a wheat dressing works. I can only presume that William was still using the Down name for that side of the business for reasons of ease and customer familiarity. According to the Bedfordshire Times, of October 23rd, 1914, William gave Avenue House, rent and rates free, to be used by Belgian refugees. In 1915, he donated premises free of rent to house the local fire brigade in Russell Street, and also financed the erection of a shed to house their appliance. Of Henry Downs children, I have found the following: the eldest, Henry, eventually died in a nursing home in London on April 16th, 1944, aged 65. A small report in The Times states that he was known as Tod Down, and had married, his wife being called Ada. Robert Haydon Down was schooled at Bedford. He lived subsequently with his wife Gladys at 6 Apsley Road in Clifton and was Manager of the Westbury-on-Trym branch of Lloyds Bank. In 1912-13, he started playing for Clifton Rugby Football Club. 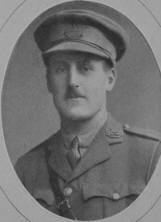 At the outbreak of World War One, he joined the Gloucestershire Regiment 1/4th Battalion in August 1914, and was appointed 2nd Lieutenant on 14th February 1915, and promoted to Temporary Lieutenant on 18th July 1916. He was in ‘A’ company of the 1/4th Battalion of the Gloucester Regiment. They were part of the attack on Pozières Ridge, a subsidiary attack of the Somme offensive. The battle was launched on 23rd July 1916, and Robert received wounds in an artillery barrage and died the next day at the No.3 Casualty Clearing Station on 17th August 1916. He was 27. He was buried at Puchewillers British Cemetery, at the Somme. His name also appears on the Lloyds Bank War Memorial at the bank’s headquarters at Canon House, London. His army service papers can be found at the National Archives at Kew. He gave his occupation as a bank clerk, and his record says he was 6’3” with blue eyes and light brown hair. His wife is listed as Gwendoline Gladys, (nee Wansbrough) whom he had married on March 8th, 1915. Grace Down, his mother, was a witness at the wedding. He fathered a daughter on 18th January 1916, Sheila Langdon. His former address of ‘Burleigh’, Southcote Road, Bournemouth, Hants, is listed as also being the address for his mother. William Needham had moved back into Avenue Lodge as a temporary measure while he built on the Weathercock Lane frontage of Sandymount. Here he built Holly Lodge with bricks from Maypole Yard Cottages, which he had pulled down on Aspley Hill in 1921. I believe he was still living here in 1922 when his wife Amelia, died on 25th June. She was then 60 and is buried in St Botolph’s Church, Aspley Guise. All of her remaining share in the property passed to William – an estate totalling nearly £8000. William remarried the next year, to Constance M. Barnes, at Newport Pagnell. He lived another eight years at Holly Lodge before he too died, on 13th November, 1930 aged 70. He was buried beside his first wife in Aspley Guise churchyard. His death notice in the local paper recorded that he had run a well-known ironmongery, but no reference was made to either the Farmer’s Friend or Melville’s, or the liquor and pubs businesses. It does state that he was a trustee for the Institute for a long period after his retirement. His second wife out-lived him, and his daughter Elsie, had married Captain Howard J. Redfern, known as Tommy, who was a London solicitor, who lived in Leighton Buzzard. They married around late 1906 and moved, firstly, to New Bushey. They had one son in 1910, James Howard Redfern. It was only after this auction that Downham Road was built on and began to look as it does today. This is the end of the Down and Needham empire. William Needham’s daughter Elsie Redfern, once widowed in 1938, returned to live at Sandymount until she moved to Leighton Buzzard in about 1950. She lived at Brackens Heath on Park Road, and died in 1956. William Bazley died in February 1947. ….and the many others who contributed details. And finally, to the late Mr Arthur Parker whose historical notes and enthusiasm inspired me and formed the basis for my own research.